Sometimes you see art and quite frankly it leaves you cold, and cold for all the wrong reasons. Other times it walks right up to you and gives you a big warm satiating hug. Sometimes, when you leave a show behind, you ‘leave it behind’. Other times it clings to you, not in a needy sort of way, but more in the sense of a momentary captivation which promises more to come, like a place you want to re-visit, something you want to get to know better. This desire to return or know better is symptomatic of sophisticated and complex work, and by that I refer to the multi layered and visually arresting. That which invites and confounds simplistic excavation. It seems to me that Alan Halsey’s Memory screen is such a work. On initial encounter the work would be best described as quiet rather than visually bombastic. Just over 200 small framed images span the 4 walls of the chamber. Their intimate scale invites an intimate viewing. The first thing such viewing requires is time, like a novel needs to be read, or a film watched. This is all before any considered judgment can be attempted. And the sheer complexity of this body of work takes time to assimliate. Each frame is meticulously put together by hand, with the author function writ large, (albeit frequently appropriative and tangential in its nature). The frames feature fragments of Halsey’s own written word, quotes from others (actual or conjured up) numerous photographic records of found graffito, images of shop windows, ornamental gardens and a plethora of literary references, plus much more. This is not for lazy viewing. Even if you gave each one only a minute of your time that’s over three hours worth of looking. And that’s before you try and work it out (which incidentally you cannot). This is a key part of its allure. It is (and I mean this in the best possible way) a slow burner. But boy does it keep burning. There is clear visual intelligence in their configuration and a palpable core of wry humour running throughout the project. Halsey has a deep love and understanding of the complexities of language vis a vis our desperate project of making sense of the world. To quote from a fragment ‘writing is to picture’ Floris interspersed as ‘emblem is to expedition’ And to throw in another ‘I is a brief as writing gets’. It is jam packed with these moments of delight, and memory screen plants them right into your consciousness. The work is rightly referred to in one of the texts as an impossible novel and this is a key clue to the work. There is no easy narrative here for the viewer to draw out, but words and images, as approximations of things themselves, set in a state of inter-twined and colliding interplay. Fragments of imagery and text reappear like actors playing different roles, in different frames, resulting in various degrees of semantic slippage, setting up a recurrent playfully paradoxical culture of resonance shift. The title for the work itself stems from a found graffiti image on a garage door. 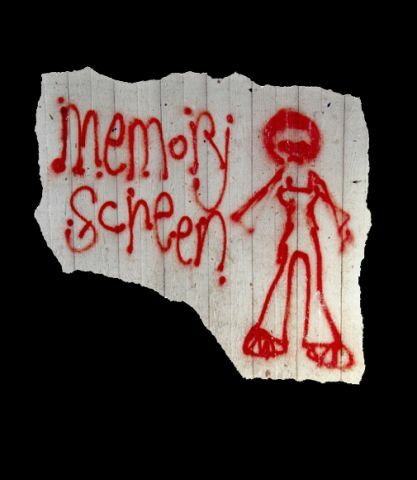 It has been a number of weeks since this show closed, but then it seems fitting to write of memory screen as a reflective process. Like all good things it makes me want to go back for seconds and thirds, maybe even fourths and fifths and hopefully get just that little bit closer. I have viewed the work several times on disc, and each time something new reveals itself. Halsey is best know as a writer, and whilst us artists are frequently known to dip our toe into the textual it is refreshing to see the boot so efficaciously worn on the other foot.